This 24.6 mile route includes grade-separated paved trail along Convict Spring Road and Lafayette County Road 354. The route begins in the town of Mayo, FL, which has a number of convenience stores and restaurants. It heads north, crossing the Suwannee River, passing the Peacock Springs Conservation Area. The bridge over the Suwannee offers scenic views of the river. While 180th Street has no shoulders, it has light traffic and a nice tree canopy. The route extends north to Wes Skiles Peacock Springs State Park (entry fee), which is home to both Peacock Spring, Bonnett Spring and an award-winning nature trail which educates visitors about one of the longest underwater cave systems in the continental United States, which is just underneath the park. Peacock Spring makes for a nice swimming hole on a hot day. From the park, the route travels back over the Suwannee, then east along Convict Spring Road where it passes by the Convict Spring Conservation Area. 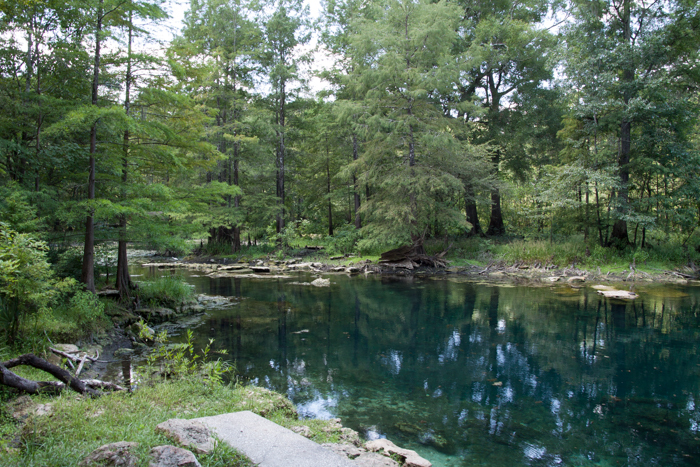 Riders have the opportunity for a quick side trip the Suwannee River Rendezvous resort and campground which is home to the small Convict Spring. This is a popular place for camping, kayaking, swimming and fishing along the river. The route then leaves the park and heads south, looping back west along U.S. 27 to end in Mayo. Mayo has a few nice restaurants, including the Great Southern Biscuit Company and the Mayo Cafe. Lodging choices for those staying overnight to ride the Mayo - R.O. Ranch route include the Le Chateau de Lafayette Bed & Breakfast in Mayo or the Suwannee River Rendezvous Resort and Campground located approximately six miles northwest of Mayo on the Suwannee River.